The COMPOSITES SURVEYS IIa and IIb covers the 08-16 UT time range (1pixel/60sec) and zooms are 1 hour long (1pixel/10sec). 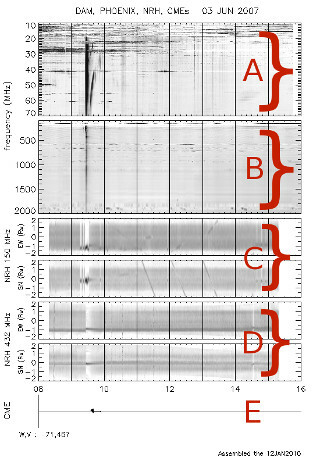 The two spectra (A and B) reported in these two surveys are similars . This spectrum displays data from DAM. When DAM is unavailable, Artemis is used instead. This spectrum displays data from Phoenix 2 because of his frequency range (which goes to 2Ghz). When Phoenix 2 is unavailable, Artemis is used instead up to 600Mhz. Please note that Phoenix 2 is no longer operationnal from 16 march 2009. So after this date, Artemis is systematicaly used. Each frame contains a display of brightness distribution projected onto the heliocentric East/West or North/South direction versus time ; the units of the vertical axis are solar radius. IIa displays in greyscale : each scan is normalised to its maximum. All the bursts are visibles but the intensity variations during the day are not well described. IIb displays in contour plot : the normalisation is made on the maximum intensity in the whole day. Contour levels are chosen in order to describe the quiet sun (at least one level) and intenses bursts. This gives a good estimate of intensity variation with the day. 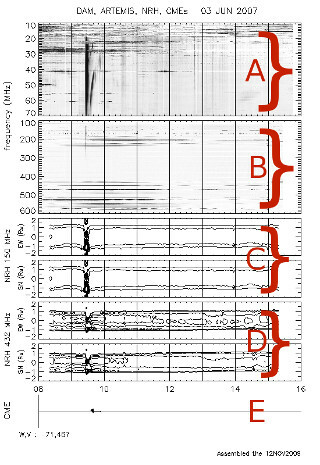 The CMEs are reported in the composites IIa and IIb survey from 08 to 16 UT.